This past week marked year number two of my now annual training trip to Boone, NC. Last year I did most of my runs with my buddy from Charlotte, Scott Williams, who was living in Boone for grad school. This year, my friend from Greenville, Tyler Pake, who just started a blog, came along for the ride. The trip was awesome. After spending the last year battling hamstring issues (and the last 6 months with shin issues), it felt great to get in some real training (after lots of small mileage weeks and biking). We got into town Monday and hit Moses Cone Park for the first run. An easy 6.5 miler and then dinner at Black Cat Burrito got the week off to a good start. The next morning was a nice solo 5 miler at none other than Price Lake. That afternoon, the goal was to tackle Fire Tower. Well, Fire Tower didn't happen, as we missed the turn at the Cone Manor and ended up on the Watkin Road loop. We got down to Bass Lake with 6.25 miles done and decided to regroup and try again in the AM. That night, we hit up Boone Saloon for the famous Taco Tuesday. $1.25 Tacos and $4.50 pitchers had the place packed wall to wall. Had a good, cheap dinner and a pitcher before retreating back to my favorite hotel in Boone, the Super 8 (cheap, clean, indoor pool, fridge, free wifi, nice employees, free breakfast). Wednesday morning we tackled the beast; Fire Tower. For those unfamiliar, Fire Tower is a well known run in Blowing Rock that starts at the bottom of Bass Lake and ends at the top of Flat Top Tower, aka Fire Tower. The run climbs 1000 feet in just 5 miles. The first 2 miles were bad up to Cone Manor, but after going under the Blue Ridge Parkway, it gets difficult. I can happily say that I never stopped to walk; something I can't say about my race Saturday. Once we hit the switchbacks after the field, it was tough. But getting to the top and climbing to the top of the tower was pretty cool. You'll see "PWP '11" scratched into the backside of the lowest level of the tower if you ever make the journey! That afternoon, our legs were fried, so an easy 30 minutes at State Farm Fields was all we could handle. We got off on the trails and hit one trail that was called something to the effect of "staircase to heaven." We got halfway up and turned around. The legs were done on hills for the day. Luckily, an awesome dinner outside at the Coyote Kitchen helped us recover for an easy track workout in the morning. Thursday morning was that easy track workout at "The Rock," App's Football Stadium. Just an easy 4x800 with a lap jog at 5:50 pace or so, then a 200 in 33 and a 400 in 73 where I had to stop dead in my tracks for a passing student. The ASU Jogging class watched us and hoped that we weren't the 8am class and that they'd have to match our workout, albeit a short one. Thursday afternoon was an easy 4 mile cutdown and some strides at Bass Lake to get the workout out of my legs. Tyler made the trek back to up Cone Manor to get some cool photos. We got some barbecue takeout at Bandana's that night to watch the Panther's game. Friday morning would mark checkout and our last run in Boone. We headed down the mountain to hit Mulberry Creek Road. This is where things got a little weird. The run was just an easy 4 miler that felt great, as we dropped about 1000 feet from the 3500 feet altitude we'd been running at all week. The fun started when we got back to the car and had one of the locals decide to tell us we were on his property. We were parked in a church parking lot. "I've been putting up with you and your dogs for four years. Yall've been scaring my livestock and if the bull I just paid $1000 for trips and breaks his neck, I'm coming up the road to take it outta ya." He assumed we ran for Zap Fitness, which is located right up the road. The funny thing is, we ran the opposite direction of his farm, and although the roads are gravel, they are public roads. Luckily, no shotguns were pulled and we were on our way. Good thing, as there was no cell phone coverage within miles! So the plan all week was to go run the Continental Divide Trail Race in Laurel Springs if I made it through without breaking anything. The legs were sore, despite my free massage during the earthquake and I was tired, but the body was holding up. So it was on to Jefferson to stay at Scott's house for the night while he competed across the country at Hood to Coast. 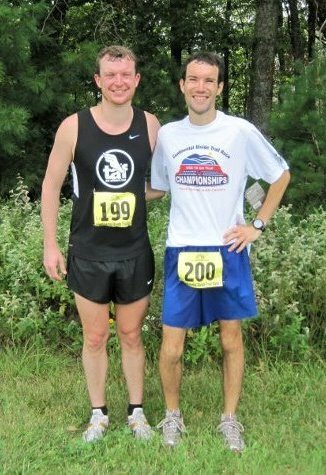 And this was the USATF National and State 10k Trail Championship. I'd earned "Hobby Jogger All American" once before (name on USATF website), maybe I could do it again. To say this race was hard does not do it justice. To say it was brutal is being a little nice. My friend Molly Nunn said is was fun. I guess it was in spots, but overall, not fun (or my idea of fun)! We had to hike up a huge hill just to register. From that point, we knew it was going to be rough. 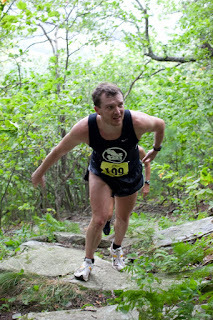 The race started at the top of a mountain and the first 3/4 mile was straight downhill. Breakneck downhill. Back side of the hill at McAlpine Park downhill, but for 3/4 of a mile. What comes down must go up and it did. I walked for the first time before the first mile. Should someone who's had recurring shin and hamstring problems attempt this race, probably not, but most runners, like myself, are sick. This pushed my limits. I almost quit here, but soldiered on. At about 1.5 miles in, I fell flat on my face. Cut my leg pretty good and scraped my knee, but popped back up, didn't get passed and carried on. At 2 miles we started climbing, and climbing and climbing. Lots of walking here. As I got back to the meadow, I saw Molly getting ready for her race and a casually cursed her. Thank god the third leg was coming up. This is where I started feeling good. Not much walking here and I passed three people. Was the nightmare over yet? Not by a long shot. Navigated the switchbacks until 5 miles or so when the straight up "climb" started. This is where I asked myself "what the heck am I doing here?" Except I didn't use heck. This was crawling on your hands and knees and "walking with your quads clutched" territory. Oh yeah, the wind was blowing hard enough to push you down. I truly felt I may fall off the side of the mountain. These were not good times. After a 15 minute final mile, we see a slow grass uphill. Thank you! Now I'm hoping to turn the corner, then get a good kick into the finish. Well I turned the corner and there was the finish. No room to kick. I crossed the line in 44th in 58:24, for a 10k. Ouch. Very thankful it was over at this point. I didn't feel overly tired, as it was hard to get in a rhythm. I felt more defeated and mad. This wasn't trail running. It was more like mountain navigating. Oh well, great week of training and I did break an hour, my initial goal. Luckily, I've had a week of training since that race and what a feeling. Even though Boone is only 3500 feet above sea level, I've been feeling the effects of coming down with great runs all week. I'll look forward to the trip again next year and will look forward to possibly another week ending race. Maybe the Maggie Valley Moonlight Race. The Continental Divide Trail Race gave me all I could handle! But who am I kidding, I'll probably be back. Well put! We are crazy for doing it but maybe were not crazy enough to do it again! 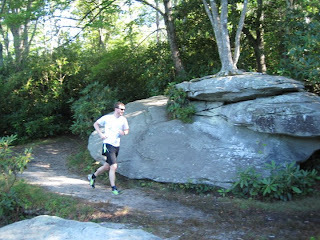 You're spot on with the lines, "This wasn't trail running. It was more like mountain navigating". Even mountain navigating sounds easier than what we did. Very interesting reading. I'll never ever complain of "hillwork" in G-Vegas ever again. Great job!